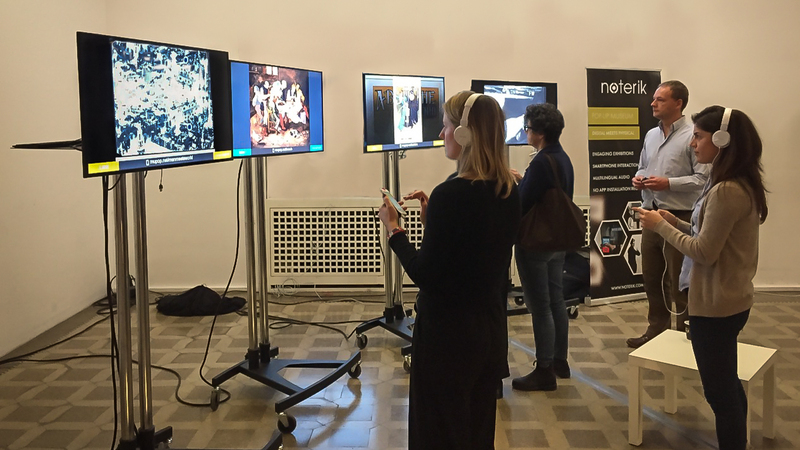 On the 21st and 22nd of November we exhibited our first real live exhibition at the final Europeana Space conference in Berlin. In the course of the conference, quite a number of attendees paid a visit to our installation in the main hall, using their smartphone to interact with the four exhibitions that were in place. In the photo exhibition curated and produced by Photoconsortium of the University of Leuven, visitors could use their phone to swipe through a collection of pictures, and select a picture to obtain additional detailed information, provided as audio on their phone. 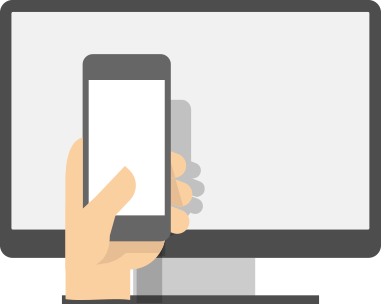 On each selected picture they could use the trackpad on their phone to move a pointer on the main screen in order to retrieve specific information on details in the picture or painting. These audio hotspots not only provided additional context metadata on the selected detail, but, in a special feature version, different characters in a Hieronymus Bosch painting were given an animated voice that provided a humoristic viewpoint on the painting. The video exhibition curated and produced by Sound and Vision allowed visitors to listen to the audio of the video in their own language (we provided English, Dutch and Greek) and while watching the video they also regularly got multiple choice question pushed to their smartphone, which provided an educational dimension to the video exhibition. The combination of the appealing display of the big screen and the intuitive touchscreen movement and personalised audio on the phone clearly engaged visitors. Some of them hung around for over ten minutes at a single exhibition, trying to spot all the details in a picture, immersing themselves into the story behind the details. The fact that all these interactions work with nothing more than an internet browser on main screen and smartphone alike, was an eye-opener for many people. Some visitors were familiar with similar interactions from their experience with Chromecast or Airplay, but the fact that this solution works without any hardware and network limitations clearly demonstrates that this is a very low-cost, low-technical-threshold solution. At the congress, on behalf of Noterik and the curating partners, Rutger Rozendal gave a presentation on the Pop-Up Museum. In his presentation slides you will find more details on the way cultural institutes can turn any kind of waiting room or other space equipped with a a big screen into a small pop-up exhibition space that can really engage visitors in the digital art they provide. We are happy to announce that as a follow-up of the conference we will be building and supporting at least 6 more pop-up exhibitions in the course of the coming 3 months, including the fashion exhibition installed in the Experience of Sound and Vision in Hilversum and a photo exhibition in a gallery in Leuven.